Visual Basic 2005 Express is designed to make Windows programming easy for everyone. Some people want to write programs for a career. Others want to create a new product. Still others want to learn for the sheer mental exhilaration. Visual Basic 2005 Express is designed to make Windows programming easy for everyone - from hobbyists to professional software developers. People may want to learn how to program their computer for any number of reasons. Some people want to write programs for a career. Others want to create a new product. Still others want to learn for the sheer mental exhilaration. Whatever your reason, with Visual Basic 2005 Express and this book, you can do it too. 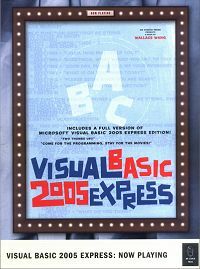 Reader Daniel McKinnon from Tewksbury, Massachusetts says,"Visual Basic 2005 Express: Now Playing is a wonderful starter book for anyone that is new to Visual Basic and wants to quickly get their feet wet and start rapidly developing applications which can do more than you might have ever expected! Written in a nice, easy to follow style by Wallace Wang, this text has the typical No Starch design which is not only easy on the eyes but the brain as well. Logically separated out into 30 chapters (this might sound like a lot but I assure you it's not overpowering), this book assumes that you have little to no programming experience, and it won't have you running in the other direction like some other 1,000 page books might, covered front to back in terms and words that are truly overkill. If you are new to programming with Visual Basic or want to learn about some of the new features that are part of the 2005 API, pick up this text and you'll be programming in no time! HIGHLY RECOMMENDED"
Reader D.J. Young from Melbourne, Australia says,"I'm just starting out learning Visual Basic. I found this book was very helpful. Written in simple and easy to follow English. If you are new to learning VB 2005 then this is a good start. Wallace also uses his own unique sense of humour in the book which makes it even more enjoyable to read."